It's like I already feel the pain from his punch. This one is perfect for you, man! Cool! So what is this, some kind of wrestling thing or something? Nathan, it's mixed martial arts. It's like wrestling (but real) mixed with boxing and some kung fu movies. Dave, too bad this never really happened, Dana incorporating Fedor into his organization I mean. Dan, I'm guessing MMA isn't a popular subject with the rest of the twartists? I must confess I've never watched an MMA event in my life. I have nothing against it -- I just have NO knowledge of it (aside from what it basically is). As such, I really wouldn't even know where to start to pick a guy to draw! I'd just be picking some loser at random just because he's got a funny face. Then I'd probably be mocked and pushed down by the Reverend and the Barbarian if I ever meet them in person for my ignorance. No, no ... best not to post anything at all. There's just too much at risk! 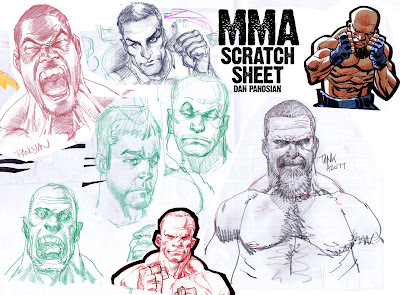 Yeah, I think the other Twartists are neck deep in deadlines and MMA hasn't crossed over into their mainstream consciousness. It's funny because, for me - MMA is lot like comic books when it comes to characters. You have fighters with very distinct personalities and skill sets. It makes for some entertaining action and even drama at times. 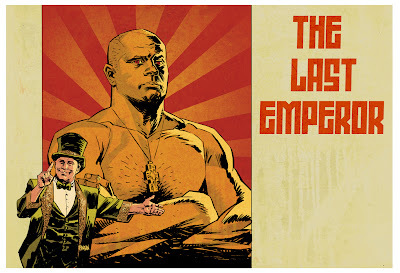 I love the colors on the Last Emperor piece, Dan. Great highlight off of the right side of the figure. Your work is spectacular. MMA fans around the world are going to go nuts over your illustration of Fedor.